The greatest Galician festival of all is held on 25th July, turning the city of Santiago de Compostela and its cathedral into the principal summer reference. It is a meeting point for ancient trails and European traditions. All Galician festivals and “romerías” represent an ancient call to gather around sacred and profane elements that contain a heavy sense of symbolism. 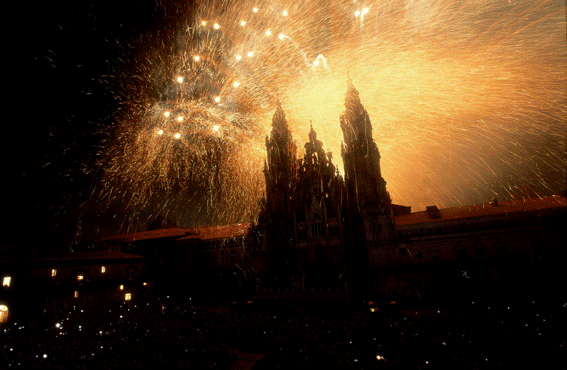 At midnight on the eve of the Day of the Apostle, a spectacular fireworks display is held in Obradoiro Square, including the traditional “burning of the Cathedral façade”, further proof of the ancient cult to the colourful igneous phenomena, staged by firework experts. The fantasy of lights, colour and creativity brings out the full force of the Baroque stonework that characterises the city’s architectural heritage. On the morning of the 25th a solemn offering is made to the Apostle in the cathedral, followed by a parade around the streets featuring giant headed figures accompanied by traditional music and concerts in the city’s squares. “Romerías” and festivities take place in the carballeiras, under a canopy of centuries-old oak trees. The Festival of the Apostle is the synthesis and essence of Galician sentiment, a call and convergence for solidarity in a historic setting. Festival of International Tourist Interest.